Camping is probably the best outdoor experience that gives you a break from the day-t0-day life hassles. It is a great time to enjoy the cool breeze and fresh outdoors. However, most campers have a small problem of privacy when changing clothes and taking a shower. Do you always feel like someone is watching you when changing your clothes? Well, it is normal to feel so even when you’re sure nobody is in the woods. 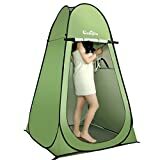 One of the best ways to shower and change clothes in the woods is by getting the camping shower tents. 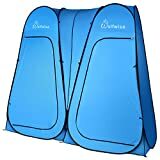 These tents are foldable, lightweight and will not take too much space. They are an excellent solution to your privacy issues when camping. Looking to buy one? Well, you’re in the right place. We are reviewing the top ten best camping shower tents for you to buy this year. Make sure you go through our reviews before ordering one. 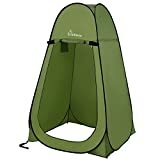 This is a pretty simple tent that sets up in seconds so that you can take a shower with confidence. It is a collapsible and lightweight tent that gives you an excellent place to shower and change clothes. The construction of the tent is the durable, flexible steel and high-quality polyester taffeta. It can withstand the harsh outdoor elements and serve you for years to come. 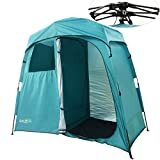 It collapses and can easily be packed in the provided tent bag. It features four stakes for stability and an open bottom design to keep it clean. The Faswin camping tent is another excellent non-bottom design for easy maintenance. The design ensures the tent remains clean and is easy to use. It is a quality selection with a closed roof and a large zippered door that allows for easy access. This bag is self-supporting and an ideal pick for campsite, backyard, pool, and beach. It is pretty easy to mount and features four stakes for stability even on windy conditions. 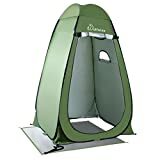 This is a two-room design shower camping tent with a solar heated 5-gallon shower to ensure you still enjoy a warm shower even in the wild. It is an excellent choice with two rooms for taking a shower and changing clothes. The separate changing room also features pockets and two racks for toiletries. It is an excellent way to keep item dry. It also features a removable rainfly and two mesh drain windows in the shower. Overall, this is a sturdy tent with 12 stakes for stability. The WolfWise camping tent brand is a quality selection with this portable design allowing for easy storage and transportation to the campsite. It is lightweight and easily collapses in seconds. You can use it take a shower, change clothes or as a restroom. The construction of the tent is the durable taffeta polyester and flexible steel metal. The polyester fabric is further coated to prevent damage from UV rays and other weather elements. A mesh roof allows for air circulation. Overall, this is an excellent and reliable camping tent that can be used for many years. The Quictent is a two-room camping tent with a durable construction featuring thicker poles and an extra-thick canvas. It is an excellent choice for taking a shower and changing clothes. The durable Oxford fabric is anti-silver coated and does not have any pungent smell. The 9.5m thick aluminum poles and fiberglass frame ensure the tent is stable and lightweight. 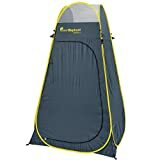 Other excellent features include a four-side water outlet, ventilation hole on the roof, solar shower and a water bag. The Privacy WolfWise camping table is another versatile selection for biking, camping, shower, toilet, beach and changing room. It features a durable fabric coating that prevents UV rays and a large zippered door for easy access. The tent weighs 11 pounds and measures 78.5 x 94 x 47 inches when open flat. However, it easily folds into a compact 24 x 2 inch to fit the carrying bag for easy transportation. The roof is meshy for improved air circulation. Overall, this is an excellent bag for all your private needs when outdoors. The Green Elephant camping tent is another high durable selection with a superior construction of water repellent polyester. It features a rugged material construction and a heavy-duty zippered door that will not break easily. The design of the bag is ergonomic with mosquito netting at the top for excellent ventilation. It comes with all necessary accessories like a shower opening, clothes hanger, towel hanger, storage pouch for personal items, toilet paper hanger, flashlight hanger and a carry bag. Overall, this is a versatile bag for various outdoor activities and one that is pretty easy to use. The Campla camping tents are a leading brand with a durable 191-D polyester fabric and special anti-UV coating to block the harmful UV rays. It is an excellent tent that will offer maximum privacy will protecting you from rain and sun. It is easy to setup with an instant pop up and effortlessly folding. A zippered window and a mesh roof vent allow for proper air circulation in your tent. The rainfly is removable. 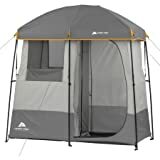 Overall, this is a valuable tent with additional features for fitting various accessories inside the tent. This is a large camp tent for private clothe changing and showering in the wild. It is a durable polyester tent with a closed top and open bottom. The tent is highly portable and easily opens or folds down for easy setup. It is easy to carry and take anywhere ranging from the beach, campsite, photo shoot, bike riding or any other outdoor activity. This is a 5-gallon camp shower with a removable hanging towel bar and mesh shower rack inside. It is a large tent measuring 87 inches high to fit all people easily. The door style is the large D-zipper for easy entry and exit. The construction of the walls is the heavy duty and durable polyurethane taffeta coating. It also features a removable rainfly and rip-stop floor. The frame of the tent is the durable rust-resistant steel with durable clips to keep the tent stable and sturdy. A no-see mesh window allows for good air flow while allowing good visibility inside the tent. If you camp often then you need one of these amazing camping tents. These are the best camping tents on the market currently to offer you the much-needed privacy outdoors. They are of excellent quality and durable construction to offer you good value for your money.